The Hallaron Agency last won an Addy in 2012. We had not submitted work for an award since then, but after a meeting with our growing agency team it was agreed we would take part once again in 2016. After all, we welcomed two new art directors and another graphic designer in 2015 and Senior Art Director Kelley Cain returned to Hallaron after two years away. In January, we turned in our entries representing six separate categories including packaging design, videos, TV commercials, a website and print designs. We are proud to say that our team took home two “Addys” on Thursday night, February 18 at the American Advertising Federation (AAF) annual Advertising Awards held at Union Station at Minute Maid Park in Houston. 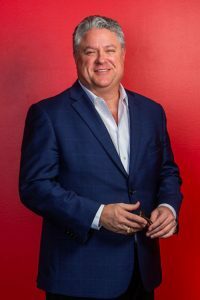 More than 50 local ad agencies entered in dozens of categories competing for the prestigious awards. We were proud and honored to be counted among the other exceptional entrants. Hallaron’s accolades this year included a Silver Addy for a website and a Certificate of Excellence for a video we produced. Both pieces of work were on behalf of client Hannon Hydraulics in Dallas and Houston. The evening marked an encouraging return back to agency competition. Silver Addy – Website B-to-B Services. 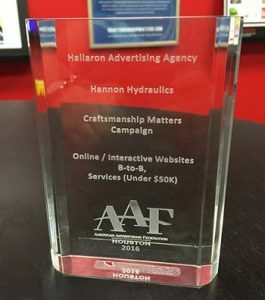 “Craftsmanship Matters Campaign” for Hannon Hydraulics. Certificate of Excellence – Internet Video. “Craftsmanship Matters Campaign. Meet Steve Daniel” for Hannon Hydraulics. Congratulations to the Hallaron team for your fantastic work and to our terrific client Hannon Hydraulics!